As you would know (if you read this blog – despite the fact that I seem to post quite infrequently) I am working at Blick Creative full time as a designer. This post is mostly to mark how much I am enjoying it, despite this week being a lot of simply learning the ropes. The people are great, the studio is lovely and the work is varied and fun. In terms of it being a Saturday, it appears the slightly earlier start (and probably the happy-stress of newness) has caught up with me and I am quite exhausted. It will be lovely to get into a proper routine. Not all these things have been bad, infact on the whole they’ve been a step in a direction toward the better. But we are fairly tired and are both looking forward to some kind of vague stability for a while. So here we are. Perhaps we’ll have a holiday in New Zealand later in the year, but besides that we’re probably staying put even if you try to drag us. Lets think about actually living for a while. Speaking of houses, a friend recently went to the Solomons and they took a photo of the house we used to own and lived in for some time! Weird. And super cool. We used to do school in that bit to the side. It was on a lean back then too. My fingers are not as fluent as they are with a pen as they are with a keyboard so here is my confession that my journal writing was not so up to scratch as I would have liked while being away. In a small way my brain stalled. I will share what I did wind up writing, but the perpetual blow by blow will present itself in the group journal – to which I contributed to on Day 11. Trivial information for you, but I do not have access to that particular entry until the rest of the crew return, so there will be an intentional gap alongside the many unintentional. Tonight I had a read of The Pink Elephant in the Missional Room and had to agree on the lack of courage displayed in the act of my generation sharing ‘their faith’. My biggest fear or hurdle or perhaps ‘bother’ was something I didn’t end up actually doing. As part of preparation for the trip we were asked to work out how we would share what God has done in our lives – in a way that was vaguely culturally appropriate, should we have to share it in the Solomons. And I got stuck in pinning it down. And this is a position that I’m not exactly comfortable in being in, because opportunities can launch themselves at you very unexpectedly. It personally disturbs me that I don’t really know how to talk specifically about God in my life. Although God can use our mouths and willingness when approached, I don’t think that we too often go searching for those conversations. I know I pretty much wait for them to drop into my lap, at most I might pray for an opportunity. When it comes to ‘mission’ – and by that I mean, talking about Jesus, we are cowards. This is Beverly Kumasi. She doesn’t ask permission to be a Christian. On the outside she looks like a fairly average Solomon Island, Malaitan woman. She has five kids. Her husband is a pastor. We used to play with their girls, Sherry and Queenie. On the other hand Bev is an a-typical Solomons woman. She is outspoken, her wantoks (relatives) extend far beyond her blood. 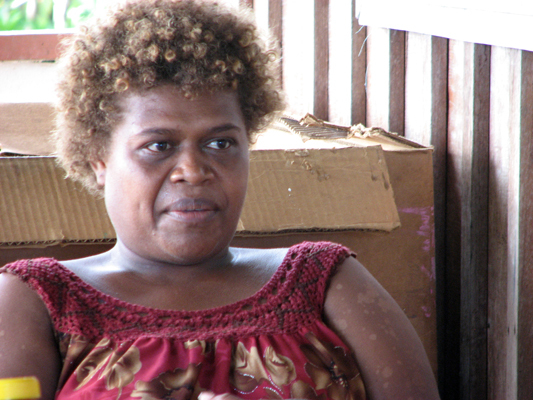 She is mother to many, pastors her own church, advocates for HIV education – telling UNICEF to take their condoms to hell* (HIV is a recent occurrence in the Solomons and will soon become a huge problem, there’s been a jump from 3-300 affected by AIDS in the past few years), and she somehow raises enough money a year to send one of her ‘street kids’ to Bible School, she wants to build a youth centre. 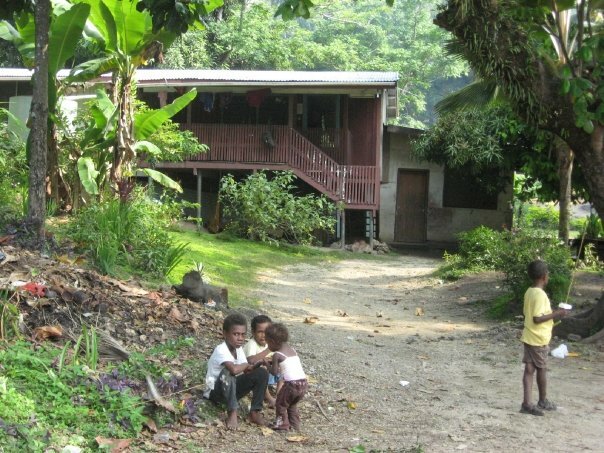 Bev tells this story of two local gangs based on islands in Lunga river, based just outside Honiara. Gangs like these formed after the ethnic conflict that began back in early 2000. She went down to this ostracised group of young men and asked to speak to them. The gang leader threatened to shoot her and she retorted with something like, “A man who shoots a woman is a woman forever”. He let her approach. She hugged him, accepted him and shared Jesus with him. Those same Lunga gangs no longer exist. She is entirely legitimate. She talks about the Kingdom of God as if it runs through her blood. She seeks out people to love and to share Jesus with and her home. She expresses her frustration at churches who sit singing and never go and ‘do the work of the gospel’. This is courage and makes the rest of us looks like pansies. Mission is not for pansies. Yet sometimes that’s all we’ve got to work with – ourselves. Let us at least be willing. *In relation to their request for her to distribute them to some of the young prositutes she helps rehabilitate. Should there be some almighty drumroll? I surely don’t deserve it, I haven’t put half as much thought into any of this as I would’ve liked. Tonight we fly to Brisbane, tomorrow to the Solomons – about a 3.5hr flight – the country I grew up in. They spot interviewed us at a ‘team meeting’ the other day and my answers sounded hashed and somewhat shallow. In reality, returning is very much more for me about showing off to Geoff a part of me and revisiting the place for myself, than it is about handing out Bibles. How ignoble. It’s unfortunate it possibly wont be quite as easy as a tourist holiday. The one thing I have thought about is my reaction to when we get off that plane at Henderson Airport and I suddenly get hit by that distinctive smell. Reminds me of that annoying MercyMe song, “I Can Only Imagine”. Well, I can only imagine I will either start crying (probably less likely) or I’ll be struck somewhat dumb and the emotion will resonate only in my eyes which will grow wide (probably more likely)… or hey the converse. Perhaps the excitement will creep speedily through my body and come out my mouth in words. I think I can probably predict the combination of a enormous lump in my swallowing machine and a contrasting, yet genuine smile. Do I know what God will do me when I’m there? No. But I think I might take the opportunity to ask myself some hard questions and we’ll see where that all goes. In two days I will be back in the 32 degree weather, with the 100% humidity, the dust, the green, the sea, the birds, the mosquitoes, the dogs howling, the locals calling me ariquo and better fruit than the likes of Australia has ever seen. In the next week, I will have seen the dog I haven’t seen for the past 7 years, the house I lived in, the beaches I snorkelled at, the basketball court and the ERC, the SWIM base, the local markets, the ‘city’ much changed. And in another again, I will be back here. I do not know if I will want to be back here. My patriotism has never been very cemented.